Sure, you already know this. But it never hurts to post a reminder with a nice graphical memory aid. Nickel summary: the richest of the rich have gotten even richer over the past two decades — 400% richer for the top 400, according to CBPP, in a nice bit of symmetry — and at the same time their federal income tax rates have gone down from 30% to 16%. Needless to say, this is further evidence that America’s heirs and Wall Street tycoons, the targets of endless class warfare from liberals and Democrats, deserves to have the estate tax eliminated. They’ve suffered enough already. 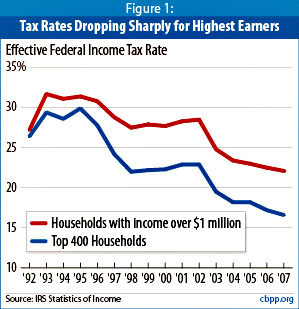 The low effective tax rate for the top 400 filers is largely due to the fact that capital gains and qualified dividends are taxed at much lower rates than ordinary income….It is not surprising that two of the largest reductions in effective tax rates for the top 400 filers occurred in two two-year periods (1996-1998 and 2002-2004) that coincided with the capital gains tax cuts enacted in 1997 and 2003. The second half of this paragraph seems fine: tax rates for the wealthy really did fall starting in 2003, which is almost certainly due to the Bush tax cuts. But the Clinton capital gains cuts took effect in mid-1997. How could they be responsible for a drop that began in 1996? What happened in 1995 to get the ball rolling?